Born at Montemoro Novo, Portugal, 8 March, 1495, of devout Christian parents; died at Granada, 8 March, 1550. The wonders attending the saints birth heralded a life many-sided in its interests, but dominated throughout by implicit fidelity to the grace of God. A Spanish priest whom he followed to Oropeza, Spain, in his ninth year left him in charge of the chief shepherd of the place, to whom he gradually endeared himself through his punctuality and fidelity to duty, as well as his earnest piety. When he had reached manhood, to escape his master's well-meant, but persistent, offer of his daughter's hand in marriage, John took service for a time in the army of Charles V, and on the renewal of the proposal he enlisted in a regiment on its way to Austria to do battle with the Turks. Succeeding years found him first at his birthplace, saddened by the news of his mother's premature death, which had followed close upon his mysterious disappearance; then a shepherd at Seville and still later at Gibraltar, on the way to Africa, to ransom with his liberty Christians held captive by the Moors. He accompanied to Africa a Portuguese family just expelled from the country, to whom charity impelled him to offer his services. On the advice of his confessor he soon returned to Gilbratar, where, brief as had been the time since the invention of the printing-press, he inaugurated the Apostolate of the printed page, by making the circuit of the towns and villages about Gilbratar, selling religious books and pictures, with practically no margin of profit, in order to place them within the reach of all. It was during this period of his life that he is said to have been granted the vision of the Infant Jesus, Who bestowed on him the name by which he was later known, John of God, also bidding him to go to Granada. There he was so deeply impressed by the preaching of Blessed John of Avila that he distributed his worldly goods and went through the streets of the city, beating his breast and calling on God for mercy. For some time his sanity was doubted by the people and he was dealt with as a madman, until the zealous preacher obliged him to desist from his lamentations and take some other method of atoning for his past life. He then made a pilgrimage to the shrine of Our Lady of Guadeloupe, where the nature of his vocation was revealed to him by the Blessed Virgin. Returning to Granada, he gave himself up to the service of the sick and poor, renting a house in which to care for them and after furnishing it with what was necessary, he searched the city for those afflicted with all manner of disease, bearing on his shoulders any who were unable to walk. For some time he was alone in his charitable work soliciting by night the needful supplies, and by day attending scrupulously to the needs of his patients and the rare of the hospital; but he soon received the co-operation of charitable priests and physicians. Many beautiful stories are related of the heavenly guests who visited him during the early days of herculean tasks, which were lightened at times by St.Raphael in person. 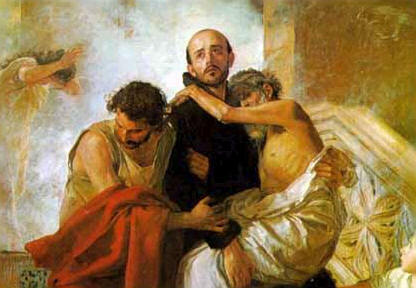 To put a stop to the saint's habit of exchanging his cloak with any beggar he chanced to meet, Don Sebastian Ramirez, Bishop of Tuy, had made for him a habit, which was later adopted in all its essentials as the religious garb of his followers, and he imposed on him for all time the name given him by the Infant Jesus, John of God. The saint's first two companions, Antonio Martin and Pedro Velasco, once bitter enemies who had scandalised all Granada with their quarrels and dissipations, were converted through his prayers and formed the nucleus of a flourishing congregation. The former advanced so far on the way of perfection that the saint on his death-bed commended him to his followers as his successor in the government of the order. The latter, Peter the Sinner, as he called himself, became a model of humility and charity.